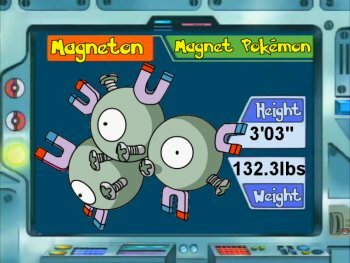 Magneton, The Magnet Pokémon. It emits a powerful magnetic force that is fatal to electronics and precision instruments. Because of this, it is said that some towns warn people to keep any Magneton inside a Pokéball. It is actually three Magnemite linked by magnetism. It generates powerful radio waves that raise temperatures by 3.6 degrees F within a 3,300-foot radius. It discharges powerful magnetic waves at high voltage. They frequently appear when sunspots flare up. Magneton is undeniably the best Skarmory counter in the game. It’s one of three Pokémon (the other two being Nosepass and Wobbuffet) who can stop Skarmory from leaving play and out of the three it is the best at one-hit KOing it. Unfortunately, beyond countering Skarmory there isn’t much it can do. It struggles to switch into Water types due to a weak Special Defense and HP stat and no resistance to Surf, seriously diminishing its hopes of being a solid Water-type counter, it’s ability to special sweep is ruined by a weak speed stat (and no speed boosting moves) and its ability to wall physical attacks is hurt by weak HP and a lot of physical weaknesses. It still can pull off a few other things, namely countering Metagross’s holding Choice Bands and countering Jirachi (to some extent) with the help of Metal Sound. As far as the rest of the move set is concerned, the Hidden Power needs to be focused at pacific Pokémon. Fire is needed for Forretress since the majority of Forrys have Earthquake and Thunderbolt doesn’t OHKO it. Ice is used for Grass and Ground types as well as Salamence switch ins and Grass is used for Ground types and pacifically Swampert switch ins. The final two move slots almost always end up being rarely used fillers. Thunder Wave is one of the more popular since paralysis always helps, Substitute is also rather popular since it allows you to scout your opponent’s moves. 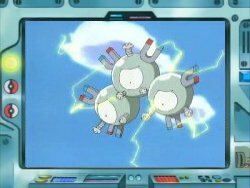 Metal Sound gives Magneton a fighting chance against non-EQ Snorlax as well as allowing it to stop Calm Minders. Reflect is nearly never seen but it’s still a decent move that Magneton can use, Swagger could be used with Thunder Wave for ‘Para-fusion’ although that’s generally not advised due to the luck reliance and the chance of you boosting the attack stat of a physical sweeper. Mimic can work on anything but it isn’t an entirely reliable move, especially when taking into account the difficulty for Magneton to take a hit. A little less Speed and a little more Defence could be considered, this is especially the case with Hidden Power [Fire] since you can’t have a Max Speed IV for it and will therefore be unable to tie speed with other Magnetons. Mostly a novelty set but it counters Adamant Dugtrios (and can counter Jolly ones with a Timid Nature) and can surprise the standard Choice Banders. Still, the majority of Magneton’s other fillers are more useful than Endure. From the point of view as a Skarmory or Forretress user the only counter is properly timed prediction. Forretress’s advantage over Skarmory in this situation is its ability to Earthquake as Magneton switches in while Skarmory has only two options. Skarmory can either Whirlwind to scout for Magnetons or it can switch to something that can counter Magneton (although this doesn’t truly counter it since Magneton can still come back later and force Skarmory to run, the only exception to this is using Dugtrio or a Pokémon with Trace). As far as other Magneton counters are concerned: Blissey and Snorlax stop Magneton cold when it hasn’t got Metal Sound. Regice stops it regardless of Metal Sound due to the Clear Body trait. Swampert stops Magneton when it doesn’t have Hidden Power Grass, anything with Volt Absorb also stops it cold as well. Gardevoir, Porygon2 and Dugtrio can directly counter it since they can trap it in play and proceed to KO it, Wobbuffet also gets special mention although it can only Encore its non-offensive moves (since no smart Magneton user would directly attack a full health Wobbuffet) and then switch to something that’ll set up on it. Ground, Fire, Fighting and any attacks that do normal damage easily counter Magneton as well as STAB attacks that are “Not very effective”. Episode 30: Sparks Fly For Magnemite! Episode 103: Get Along Little Pokémon! Episode 270: Tie One On! Episode 316: Watt's With Wattson! Episode 334: All Torkoal, No Play!